Barcelona, (UrduPoint / Pakistan Point News - APP - 17th Apr, 2019 ) :Lionel Messi lit up Camp Nou and devastated Manchester United before firing a warning to Barcelona that they cannot start slowly again. Barca were superior to United in all departments for the best part of 80 minutes on Tuesday, a 3-0 win perhaps even flattering for their opponents, who were two down in 20, both goals belonging to Messi. 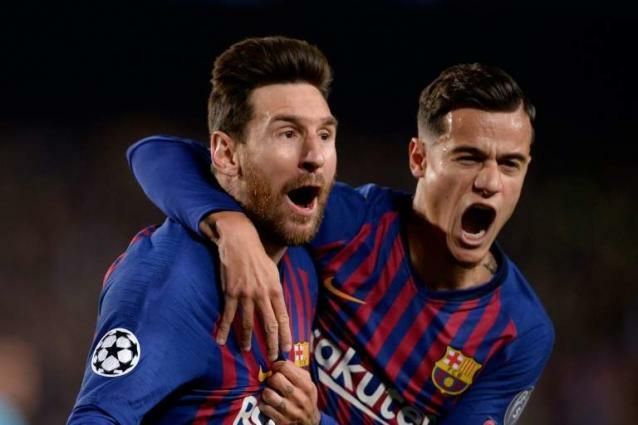 By the time Philippe Coutinho had curved in a third to send Ernesto Valverde's side into the Champions League semi-finals, United's stirring opening was long-forgotten, except by Barcelona's captain. "We put on a spectacle," said Messi. "But we came out cold and looked nervous in the first five minutes. We cannot come out like that in a Champions League match. Five bad minutes can knock you out." "We have shown who we are," Messi added, and in some ways, they were a perfect picture of their season. Thrust into a position of comfort by their mesmeric number 10, Barca put on an exhibition of attacking, possession football, all tricks, flicks and bicycle kicks. But there was also a nervousness at the start, seen briefly against Lyon in the previous round too, that suggests their desperation to win this tournament for the first time since 2015, and win it for Messi, does not weigh lightly. "We had a lot of motivation for this tie, I can't deny it," said Valverde. "Especially after not being in the semis for a long time and after last year's painful defeat. We were extremely focused." And United's early threat was genuine. Their knack of breaking through central midfield, with only space and a backpedalling Barca defence ahead of them, exposed a fragility against pace and counter-attack that has never been far away. - Liverpool pose possible threat - Liverpool carry a 2-0 lead over Porto into their second leg in Portugal on Wednesday and if it is to be them in the semi-finals, Mohamed Salah, Roberto Firmino and Sadio Mane might justifiably feel there is a weakness to exploit. "We have had five difficult minutes because they started strong," said Valverde. "But then there were another 85 minutes where we were not too bad." Most deficiencies can be rectified by Messi, whose 109th and 110th goals in the Champions were, mysteriously, his first in a quarter-final since 2013. "It was a streak he was always going to break," said Sergio Busquets. He also has potentially three extra games now to reduce the gap on Cristiano Ronaldo's unbeaten 126, after Juventus were knocked out by Ajax. "You can plan as many tactics as you like," said United's coach Ole Gunnar Solskjaer. "If you give him time and space, he will score." When Messi pledged to bring "that beautiful cup back to Camp Nou" at the start of the season, the sense was of reordered priorities, that he and Barcelona would push harder in Europe, even if it came at the expense of their form in La Liga. Real Madrid and Atletico Madrid's failings have ensured the price has been small, with Valverde able to rest 10 players against Huesca last weekend and still see his team sitting nine points clear. An eighth league title in 11 years will become a double if they beat Valencia in the final of the Copa del Rey, and a treble, if they can see off Liverpool or Porto and then Manchester City, Tottenham or Ajax at Atletico's Wanda Metropolitano on June 1. If it is to be three consecutive English opponents, Messi might be pleased. He is now the fourth highest scorer against the Premier League's top-six sides, with 24 goals, despite never having played in the Premier League. "We are not going to ask say sorry for having Messi," Valverde said. "Although it certainly is lucky for us."